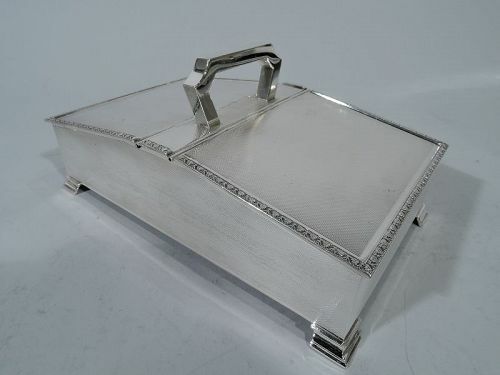 Discover a variety of sophisticated sterling silver cigar boxes at Nelson & Nelson Antiques. These collectible cigar boxes are available in a variety of styles to match your existing decor and personal taste, including Edwardian and Arts & Crafts. Each humidor makes an excellent gift or addition to your fine silver collection, study, den, or home office. With these delightful boxes on display, youll be sure to impress your guests and prompt thought provoking conversations. 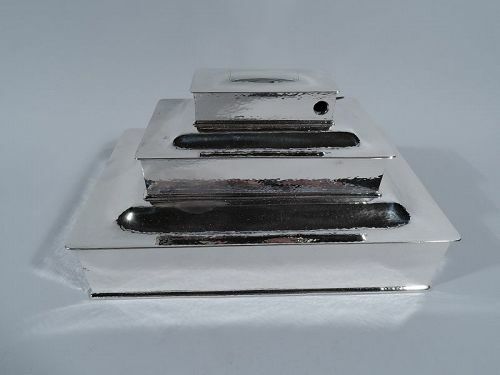 Depending on the design, these sterling silver cigar boxes feature gorgeous ornamental engravings, handy partitions, sponge holders, cedar linings, and more. Youll find humidors in a range of sizes from large, heavy boxes to small boxes perfect for holding matches. We carry collectible cigar boxes from Tiffany & Co., Gorham, Howard & Co., and other masterful silversmiths.